This is a lovely breakfast. It could be made with just about any fresh fruit because tarragon is a sweet herb that loves to be in desserts and chèvre (goat cheese) and fruit is always divine. I am not sure this actually requires a recipe post, other than I suppose folks need encouragement to add some herbs to their fruits. My best friend makes an amazing chocolate tarragon soufflé. A bit of tarragon in scrambled eggs is amazing. Some zucchini and tomatoes and tarragon is delicious, but really, nothing is tastier than a bit of chèvre, tarragon and some fruit. Tarragon has this delicious flavor somewhere between anise and vanilla that can’t be beat. 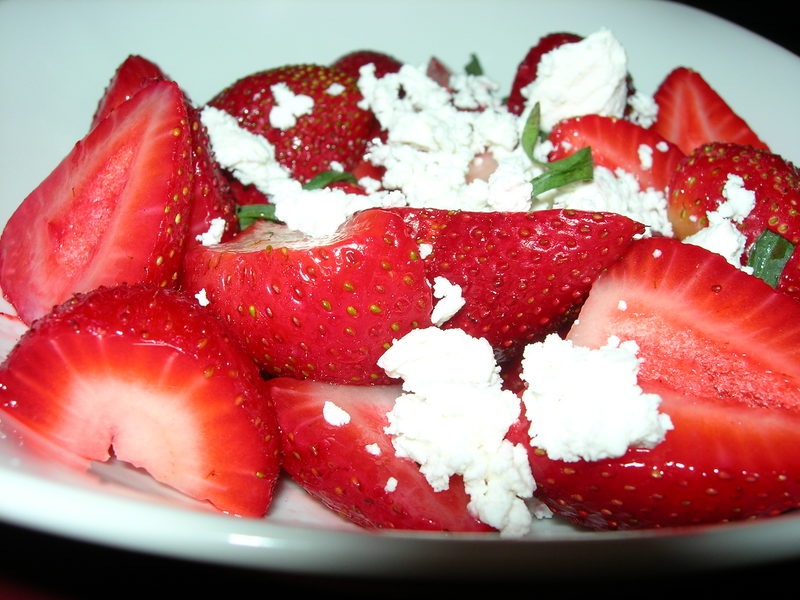 To make this, clean some strawberries and slice them in half. Take one sprig of tarragon and pull off the leaves and sprinkle on the strawberries. 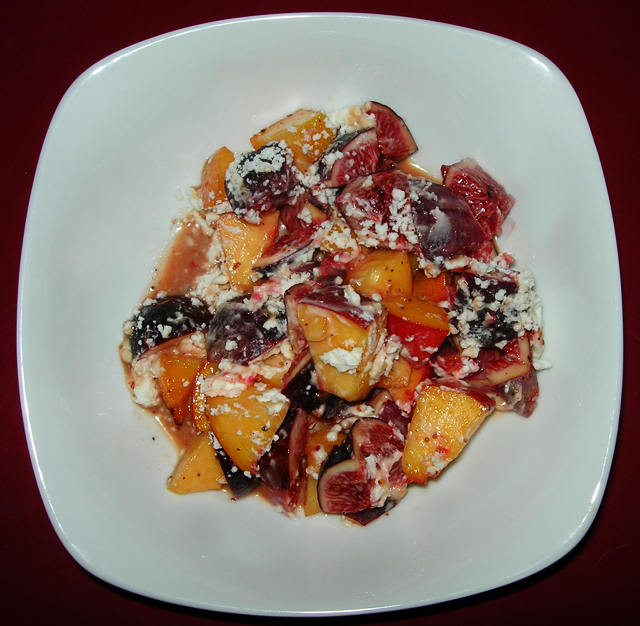 Use a fork to spread a bit of chèvre over the fruit and it’s done. And it’s delicious. I threw this together in just a few minutes and it was delicious. I decided to name it Asparagus Diablo after an alliance member in an MMO I play, but cherries do make it red, so it sort of fits. I took 6 asparagus and sliced them vertically, then I sliced them horizontally in fourths. The bottom ends, I cut in half again so all the pieces were about the same size in order to cook evenly. I began heating water with a dash of salt. When it came to a rolling boil, I added the asparagus and let cook for 1 minute – just to parboil them. I did not want them softened and mushy, but retaining a bit of their texture. You could say they were al dente. Meanwhile, I cut three paper-thin slices off a red onion and chopped them into small pieces. I heated 2 tsp of olive oil in a small pan and sautéed the onion. While the onion cooked, I pitted 10 cherries and cut them into quarters. 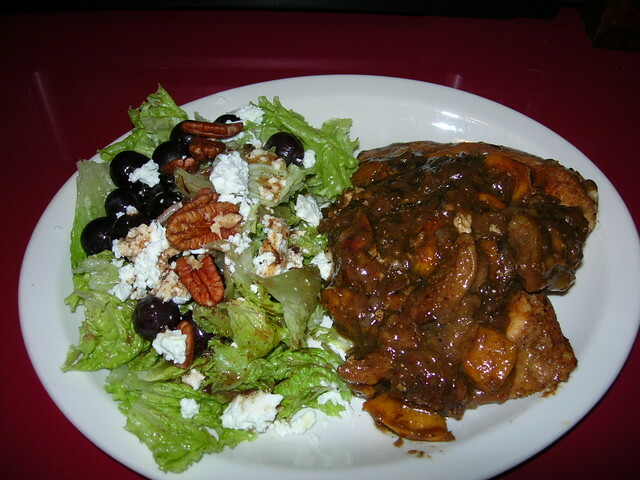 When the onions were tender, I added the cherries and cooked on medium heat, smashing the cherries with my wooden spoon. When they were softened and liquefying, I added 1 tbsp or so of balsamic vinegar and stirred it all together and let it cook for about 30 more seconds. By now the asparagus was done, so I drained it and placed in a bowl. 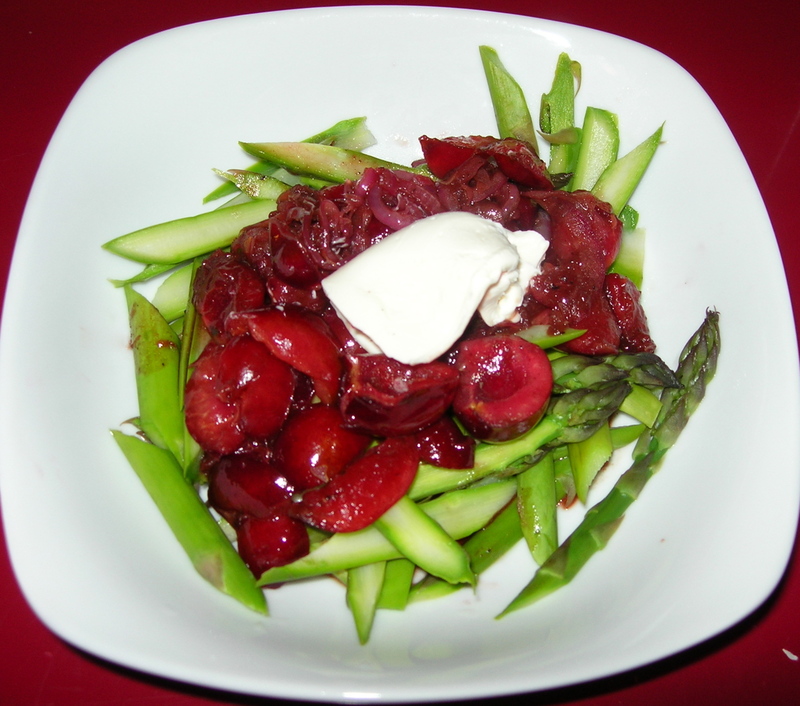 I poured the cherry vinaigrette on top and added a dollop of goat cheese. This made one serving. The asparagus tasted like spring. The cherries were a delicious mix of sweet, sour and tangy and the sweetness of the cheese balanced everything. I doubt this really calls for a recipe post, but seriously what can be more delicious and refreshing than a lovely bowl of fruit? A lovely bowl of fruit with a bit of chevre, that’s what. 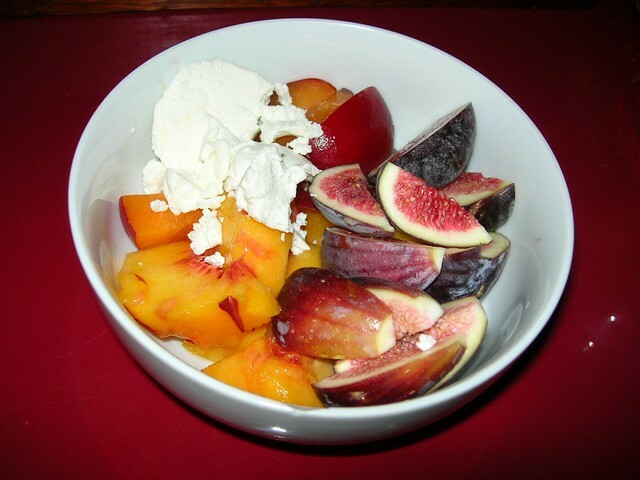 In this bowl, one peach, on plucot (plum/apricot hybrid) and 3 figs and about an ounce of Chevre. I love thin, multi-layer omelets and am lucky enough to have a lefse griddle so my omelet can spread the full 16 inches, filling the griddle top. It also lets me turn the temp down to the nice low 250° F so that it cooks nice and slowly without drying out too much. That’s a big omelet to make with just two eggs and to hold together while folded over six times, but the secret is in the batter. I sliced half a ripe pear on the mandoline, giving me thin, uniform slices. I crumbled an ounce of chevre into small bits in preparation. I use 2 eggs, 1 cup of milk and 4 TBSP of flour with some salt and pepper and blend it so that increases in volume by about 1/4th. I spread a little butter on the hot griddle and then pour the batter in the center. Using the griddle handles, I swirl the batter around so that it spreads evenly to all the edges. Then I wait while it cooks. Be patient and watch how the steam rises from the omelet. When the steam starts to decrease you can see that the batter is cooked, but it will still be moist. If you like a drier omelet, you can let it cook until little pockets pop up all over the upper side of the omelet, but I like it a bit moister. Now comes the tricky part. Slide your spatula (of lefse turner, if you have one) under one side of the omelet and fold it over toward the center. Then do the same on the opposite side. Then take a quarter-turn and fold in from each side again. You now have about an 8 inch by 8 inch square. 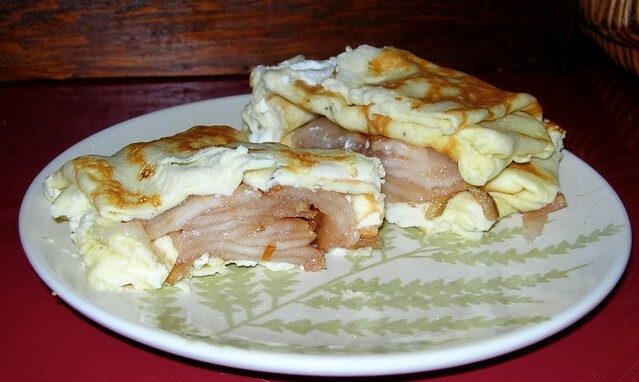 Spread some chevre along one of the sides and fold it over by a third and then spread the sliced pears and fold it over again, giving you your final omelet. I normally don’t cut it in half, but I did so you can see the chevre and pear inside of it. The pears and chevre should still be a bit cold so that they contrast with the heat of the omelet. These is a sweet, dessert-like breakfast and the fruit and cheese blend beautifully with the omelet adding a flavor foundation to highlight them. I decided to add the nutrition info after scaring someone. With half a grapefruit left from yesterday’s salad, I knew I wanted to try out something different. I thought about broiling the grapefruit for a nice char, but decided to save that for some another day. Instead I decided to caramelize them in a saute pan. But let’s start at the beginning. I cut away all the pith and peel and sectioned the grapefruit with a knife. I also chopped a small handful of almonds – perhaps 10 or so and let them sit on the cutting board while I cooked bacon. I fried two slice of bacon in a skillet until well done. When they were crispy and browned, I removed them to a paper towel, patted them dry and cut them into small pieces. While the was frying, I put the almonds in a small saute pan with no grease that I had heated on med-high. I shook the pan so the almonds didn’t blacken, but toasted evenly. As soon as they were toasted, I slid them out of the pan back onto the cutting board. I put 2 teaspoons of sugar in the same pan and tossed the grapefruit segments in, swirling them around as the sugar melted and caramelized on the segments. I used lemon sugar I made last winter because I had it on hand, but regular sugar is fine. As soon as the grapefruit began to get brown on the edges (caramelizing) I turned them out into a bowl to rest. I chopped 3 leaves of romaine lettuce and made a bed of it on the platter. I then laid down the crumbled bacon followed by the grapefruit. I sprinkled about 1 oz of chevre cheese over that and then added the toasted almonds. I drizzled 2 TSP of olive oil and about 1.5 tsp of balsamic vinegar over everything and grated some fresh pepper on top and it was done. 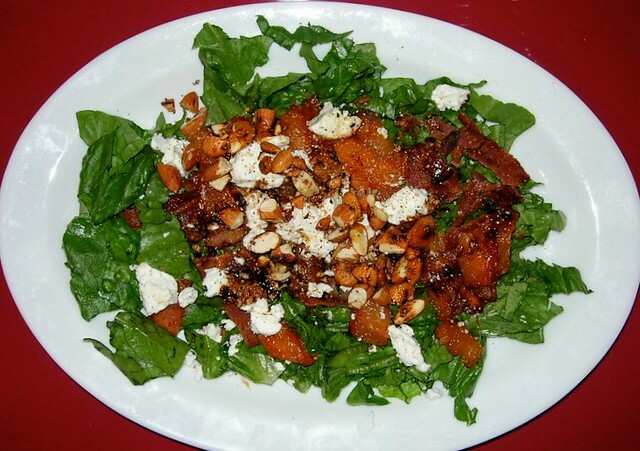 The bacon and caramelized grapefruit were made for each other, add the rich chevre and the nutty bacon and fruity smokiness of the balsamic – this was a delicious salad that I know I will make again. This was an easy layered salad that took just 5 minutes to make. This is a recipe for two salads as I had company. I took one pear and sliced thin wedges and layered them in the bottom of a small bowl. 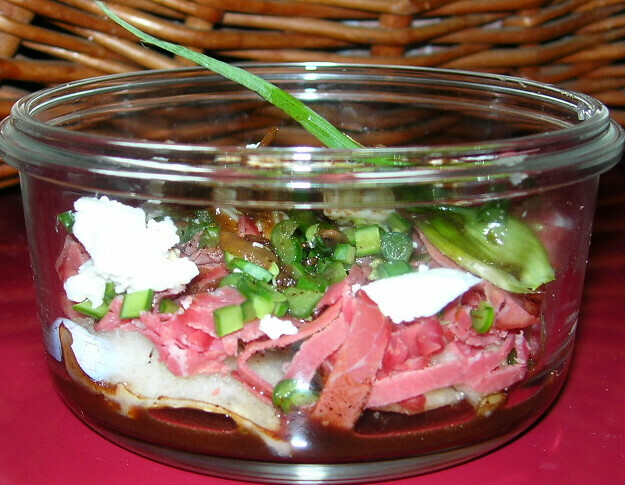 On top of that I placed a layer of sliced air-dried beef (Bresaloa). This is from Roget’s Meats in Hubbard, Oregon, and a gift from a friend of mine, but any large city should have it on sale somewhere or you can order it online. It’s more common on the east coast than on the West Coast. On top of that I crumbled a bit of chevre. I cut the tops off two garlic spears. I then cut the spears in half lengthwise and chopped the long stem into 1/4 long pieces and sprinkled on top. I had some onion vinaigrette that I made a few weeks ago and dressed the salad with that. I took the tops of the garlic shoots, cut them in half and removed the inside and used the outside for garnish. It’s springtime and there were fresh strawberries at New Seasons. I decided to make a lovely salad with it. I washed and tore up 5 romaine leaves to make a bed for the salad. I sliced up half a Gala apple and layered it over the lettuce. Then I cut two strawberries up and made a layer with them. I crumbled up about 1 ounce of chevre on top of that and tossed on a few toasted almonds. To dress the salad, I squeezed some lemon juice on top with a splash of olive oil. A bit of fresh grated pepper finished it off. It’s fresh, sweet and the fruit and chevre are a perfect combination. The tartness of the lemon and pepper balance the flavors. This is insanely delicious. When I finished lunch I was tempted to make another right away. It’s super easy taking less than 10 minutes from start to finish. I already had some toasted almonds from a salad I made yesterday, but if you don’t have any, just chop about 5 or 6 almonds and toast in a dry skillet for a few minutes until they brown. You can toast the almonds while preparing the rest of the salad. Using a vegetable peeler, I cut thin strips from 3 asparagus spears and layered half in the bottom of my salad bowl. I then cut two strawberries in thin slices and layered half of them. I took 4 pea shoots and pulled the leaves from the stems except for the tendrils at the top which I left whole. 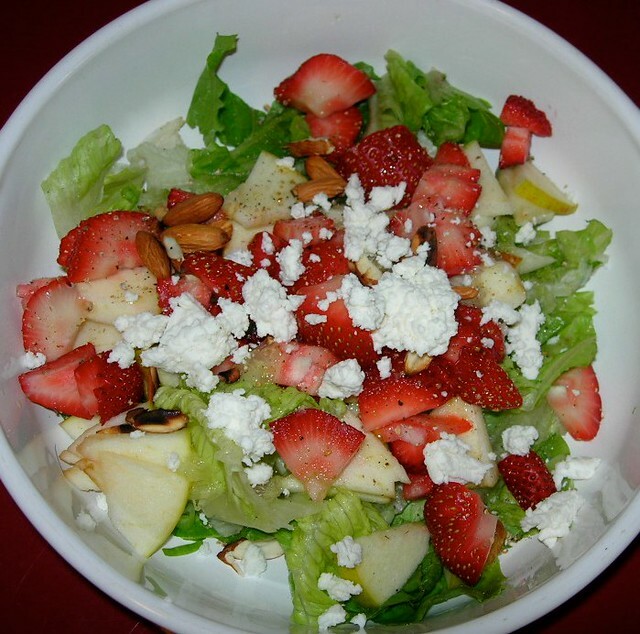 I chopped the leaves and layered on top of the strawberries. Then I put the rest of the asparagus and strawberries on top in layers. I cut thin slices from the top of a green onion, about 2 tbsps or so. 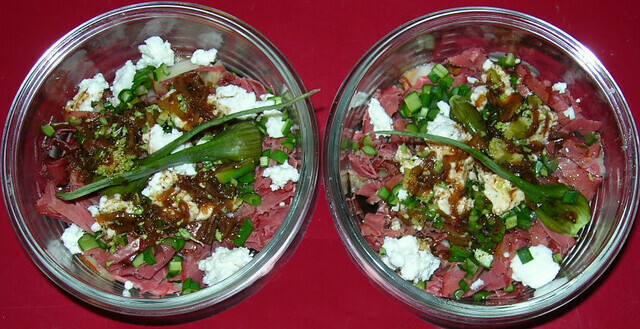 I added about 1/2 ounce or so of chevre (goat cheese), crumbling it over the top. I sprinkled the almonds on top, squeezed a quarter lemon over the top and added some salt, pepper and a drizzle of olive oil. 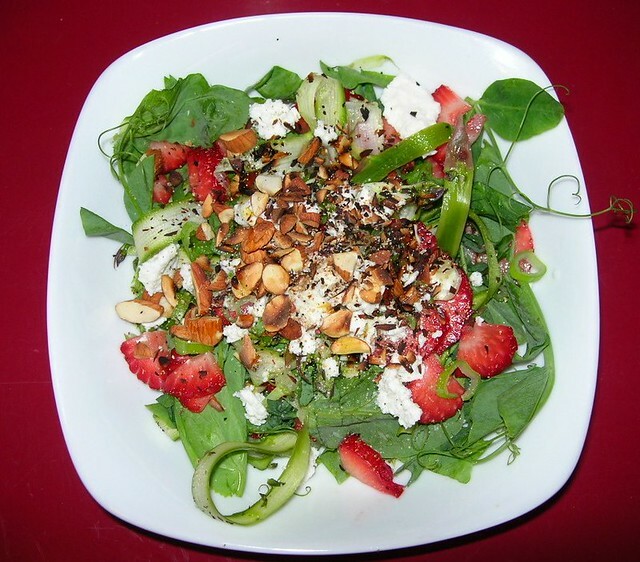 The strawberries and the toasted almonds complement each other as does the chevre. Meanwhile the pea shoots and asparagus love the bit of lemon and oil and the sweetness of the chevre brings them together beautifully. It’s a fabulous mix of flavors and tastes like springtime in a bowl.